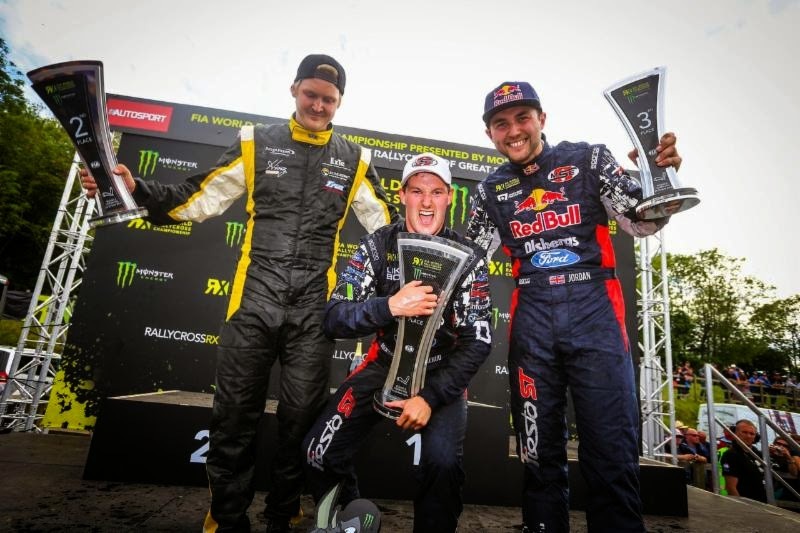 LYDDEN HILL CIRCUIT, UK (May 26, 2014) -- Olsbergs MSE Ford driver Andreas Bakkerud earned his first win of the 2014 FIA World Rallycross Championship this weekend at the Lydden Hill Circuit, while guest driver Andrew Jordan took third, to extend the team's lead in the points standings. Bakkerud set a fast pace all weekend long, leading the rankings after the first day. In his Semi-Final, he made an incredible last-corner pass to get around former World Rally Champion Petter Solberg and advance to the main event. There, he led a raucous Final on the fast-paced Lydden Hill track from start to finish. "I grew up in paddocks and it's like I have motor oil in my blood. To earn a win at a World RX round and to be leading a World Championship is a dream come true for me," said Bakkerud, as he stepped off the victory podium. "It's so incredible that I don't even think I really understand it yet,"
Bakkerud, who also earned the Monster Energy Super Charge Award for his consistent blazing starts, now leads the championship points as the series heads to his home country of Norway for the next round on June 14-15. Olsbergs MSE guest driver Jordan, the defending British Touring Car Champion and a favorite with local fans at the southeast England track, marked his return to rallycross for the first time in seven years with a third-place result. "I hoped at the beginning of the weekend that I would be able to make the Final. To get a podium -- I didn't think that would be possible," said Jordan. "I had a blast here. The British Touring Car Championship is still my focus but I'll be talking to the team to see if it might be possible to do a few more rallycross events." A disappointment for the team saw Reinis Nitiss sidelined from the Final with an electrical issue. The 18-year-old driver, who scored third place in his World RX debut with Olsbergs MSE in Portugal last month, had put in a consistent performance all weekend to secure a spot in the main event and was on pace for a return to the podium. "Sometimes luck isn't on your side," said Nitiss, last year's Super 1600 champion. "I'm happy with the weekend overall because we know as a team that we can win in this series." The young driver is fourth in the overall points standings after two rounds. The circuit was packed with an estimated 15,000 fans for an incredibly competitive round of the FIA World Rallycross Championship. A record 37 Supercars were entered in the AUTOSPORT World RX of Great Britain, along with stacked fields in the Super 1600 and TouringCar categories. In addition, the 10 Olsbergs MSE-built RX Lites returned for their second round of competition. Teenaged Red Bull phenom Mitchell De Jong took the RX Lites win in his first-ever international outing. "Of course I'm happy with the result - to have qualified all of our cars for the Final and to put two Supercars on the podium is a success," said Olsbergs MSE team owner Andreas Eriksson. "But having Reinis unable to run the Final because of an electrical issue was a major disappointment for all of us. Our team doesn't have those problems and we are going to make sure it doesn't happen again." Olsbergs MSE will return to World RX competition next month with drivers Bakkerud and Nitiss in Hell, Norway, June 14-15. Before then, Olsbergs MSE has a double-header weekend, taking on the next Rallycross Supercar Scandinavia event June 6-7 in Gothenburg, Sweden, while Red Bull Global Rallycross Championship drivers Patrik Sandell and Joni Wiman will compete at X Games in Austin, Tex., June 7.